Rosemont, Ill. (December 7, 2010) - When volleyball was invented 115 years ago in Holyoke, Mass., it was meant to be less rough than basketball, another emerging indoor sport that started four years earlier at a nearby YMCA. But as mintonette, as it was originally called, has grown in popularity - indoors and out, among men and women, professionals and amateurs, and more than 400,000 high school students today - it has also become nearly as perilous as hoops for traumatic and overuse injuries. "Volleyball players jump, spike and block during their matches, making them prone to a number of overuse injuries  in their ankles , knees , hands , shoulders and backs ," said Dr. James Andrews, leader of the STOP (Sports Trauma and Overuse Prevention) Sports Injuries campaign, a partnership of the American Orthopaedic Society for Sports Medicine (AOSSM) and a coalition of 20 other health and sport organizations. "Ankle injuries  are the No. 1 injury to volleyball players and are responsible for the most lost playing time," Andrews said. "Fingers are also vulnerable to injury during blocking, setting and digging the ball during completion." A 2007 study by the National Athletic Trainers' Association (NATA) found that at the high school level, the highest percentage of injuries affect volleyball players' ankles and feet (35.6%); hips, thighs or legs (16.2%); and forearms, wrists or hands (15.8%). In addition, experts say, the most common injuries normally are sprains , which are instant injuries to muscles (48.6%); or strains , a traumatic injury to a ligament or joint that appears more gradually (25.5%). Parents and coaches can help prevent injuries by promoting proper warm-up, stretching  and strengthening exercises, as well as paying close attention to the proper techniques, footwear , braces  and pads to play volleyball safely. "It's important for parents and coaches to understand the power they have to prevent injuries before they occur," Andrews said. 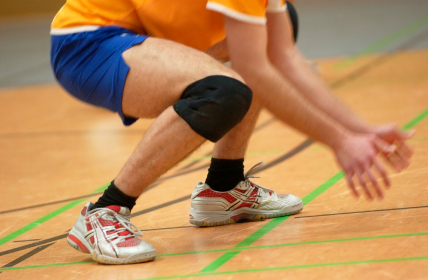 For additional tips on preventing volleyball injuries, click here .